The 3.4-liter V6 engine called 5VZ-FE was released in 1995. 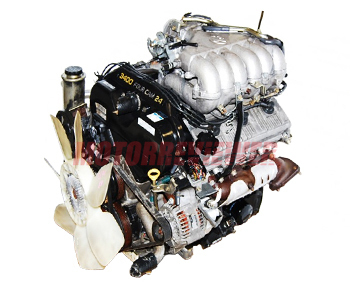 This engine was developed for Toyota SUVs and off-road vehicles specifically. The 5VZ-FE engine is based on the 3VZ-FE engine. The cast iron cylinder block is from the 3VZ-FE, but it has a bigger bore size for increasing displacement from 3.0 liters up to 3.4 liters. The engine has a V-shaped configuration with a 60-degree cylinders angle. Larger bore size required new pistons to achieve a compression ratio of 9.6:1. At the top of each cylinder block, aluminum DOHC cylinder heads were installed with four valves per cylinder. They are the same as the 3VZ-FE heads, but with slight modifications. Camshafts specs of both engines are different. 5VZ-FE camshafts were tuned for more torque at low revs compared to the 3VZ, which gives less peak torque but has a gentle flattish curve throughout most of the range. Camshafts are driven by timing belt. The engine got a new intake manifold with longer runners, which also helps to produce maximum torque at low and middle engine speed. The fuel injection system was modified; engineers used a sequential multiport fuel injection (SFI). The 5VZ-FE also got a new ignition system. The exhaust manifolds were optimized to produce more torque as well. The 5VZ engine was equipped with oil cooler and new more productive coolant fan to improve the situation with overheating on the off-road terrain. The 5VF-FE became an excellent engine for off-road vehicles and commercial trucks made by Toyota. It was produced until 2004 and then replaced by the 1GR-FE engine. The favorite way to increase the power and torque of the 5VZ is to install a supercharger on it. There are many bolt-on kits on the market available for this V6 engine like TRD supercharger kit which uses Eaton M62 supercharger. This upgrade requires replacing the stock fuel injectors by the fuel injectors from the 2JZ-GE engine or any high-performance injectors for increased fuel consumption. The output with stock bottom parts (pistons, connecting rods, crankshaft, etc.) on the boost pressure between 0.5-0.7 bar is about 250-280 hp and a lot of torque. The 5VZ is more reliable than its predecessor. But there are still can be found problems with head gasket occurred the engine overheating. The lifespan of 5VZ is a little bit longer, and it is about 200,000 miles of mileage (320,000 km). With careful maintenance and the high-quality oil, it is possible to run more miles without any troubles.